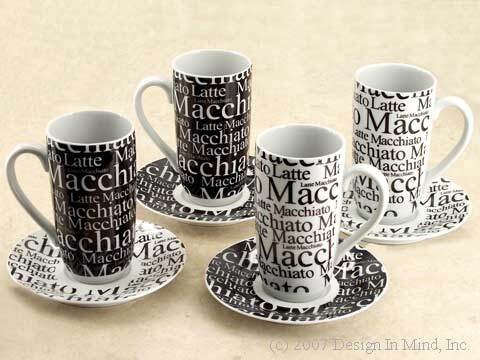 Set of 4 Macchiato Latte cups and saucers. Tall and slim, this set includes two black and two white cups and saucers. Nice weight porcelain will help keep beverages warm longer. Cups 5" tall, 10 oz. Saucers 6" dia. Microwave and dishwasher safe. Designed in Italy. Set of 4 Espresso cups and saucers with black wire carrying rack. Sturdy white china with two tone glazing. Solid color plates. 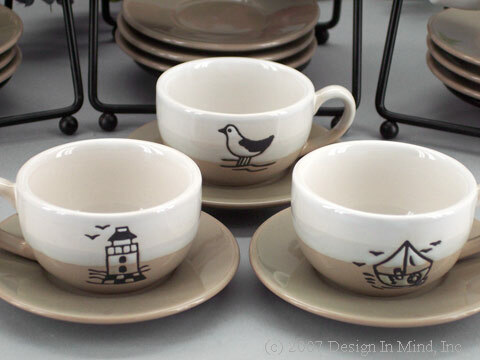 Available in 3 designs: lighthouses, sea gulls, or sails. Cups and saucers are dishwasher and microwave safe. Cup, 3 oz. Plate, 4" dia.